3 "Power in Miami-Dade County"
13 "Beyond Resistance: Reclaiming our Progressive Future"
The New Florida Majority is based in Miami Florida. It is closely allied to the Miami Workers Center and the Freedom Road Socialist Organization, and New Florida Vision PAC. Through street-level organizing The New Florida Majority is overcoming the dark days of racism and divisiveness in the Sunshine State to bring the new light of fairness and equity to all residents. In 2012, The New Florida Majority’s mobilization efforts resulted in the election of ten new progressive Federal and State legislators in Florida. Through our Breakthrough campaign, we reached more than 250,000 voters across the state, 76% of which turned out on election day. This year, The New Florida Majority organizers are mobilizing leaders to significantly expand democratic rights for communities that have been historically marginalized, excluded and silenced. The key components of the campaign are: voting rights, immigration reform, fighting mass incarceration and standing up for women and our young people. We are moving from the margins to the center of power by working together, taking ownership of our government and becoming the change we want to see we will help transform Florida. South Florida Democratic candidates who had no reason to expect victory are preparing to be sworn in to office now thanks to the votes of people whom the pollsters largely ignored: unlikely voters. One election post-mortem from the liberal nonprofit America Votes suggests unlikely voters cast 34 percent of the early and mail-in absentee votes during this election, propelling liberal Democrats such as Jose Javier Rodriguez of Miami and State Senator Maria Sachs of Boca Raton unexpectedly to the winners' circle. An unlikely voter, says America Votes Florida director Josh Geise, is one who scores below 80 on a zero-to-100 scale of voting history, age, ethnicity, neighborhood and other factors that measure the propensity for voting. The likely voter model in use by several polling organizations uses only three elements: voting history, the voter's self-described intention to vote and his or her enthusiasm for the campaign. The task for Democratic ground-gamers was to goad the unlikelys out of their torpor and campaigners say Republican legislators and Gov. Rick Scott made that easy with the voting law they passed in 2011. "The (voter roll) purges, the crackdown on early voting -- all those things that were an attempt to make those voters even less likely to vote -- those things really ticked people off," says Gihan Perera, who runs the political nonprofit New Florida Majority. FNM staff and volunteers made calls and knocked on doors for Rodriguez, Sachs and other Democrats around the state. FNM also contributed manpower and data to winning Democratic Senate candidates Dwight Bullard of Miami and Darren Soto of Orlando. On Wednesday, Aug. 3, 2016, New Florida Majority hosted a panel discussion on money, politics and power in Miami-Dade County. Featured local panelists include State Senator Dwight Bullard, Rev. Dr. R. Joaquin Willis of Church of the Open Door, and Elaine Black of Liberty City Trust. A recent study by the civil rights advocacy group Demos pinpoints a huge government-access problem in South Florida—while black people make up one-fifth of the county’s population, they represent only two percent of donors to mayoral campaigns. “Black people,” the study says, “can’t keep up with the deluge of campaign money coming from Miami’s cadre of rich lawyers, lobbyists, and real-estate tycoons.” Emmanuel Caicedo of Demos will join the panel to discuss the findings of the report and how campaign finance reform can begin to address some of these inequities. New Florida Majority joined Accountable Miami-Dade at the Elections Department to drop drop off over 125,000 signed petitions in efforts to put a campaign finance reform measure on the November ballot. New Florida Majority collected over 16,000 of the petitions. The panel is part of New Florida Majority’s RunMIA effort to engage traditionally underrepresented communities in local politics and tackle the problem of corruption and big money in county and municipal elections. WHO: State Senator Dwight Bullard, Rev. Dr. R. Joaquin Willis of Church of the Open Door, Elaine Black of Liberty City Trust, Emmanuel Caicedo of Demos, and Ginna Green of ReThink Media; moderated by New Florida Majority Executive Director Gihan Perera. One of New Florida Majority’s main goals is to educate communities that have historically faced obstacles in participating in our political system. Most of this work is done through partners like Wellstone Action, and our 501c3 organization, New Florida Majority Education Fund (NFM-EF). Miami Democratic Socialists of America April 22, 2018. Members of The New Florida Majority, United We Dream, National Nurses United, & YDSA FIU participated in today’s Democratic Socialists of America Townhall at Second Baptist Church in Richmond Hights as part of the Democratic Socialists for Medicare for All National Day of Action. Shout out to Annette Taddeo and Michael Hepburn for coming through to support #MedicareForAll. 🌹#DSAm4a — with Dwight Bullard, Religious Socialism and FLIC Votes. The New Florida Majority October 27, 2014. Join Florida New Majority, Senator Audrey Gibson, Senator Chris Smith, President of United Teachers of Dade - Fedrick Ingram, and Political Director of SEIU 1199 - Roxey Nelson for a townhall with thousands of black voters discussing the issues of the Governors' race, education, healthcare, and the criminal justice system. Roxey Nelson was replaced by SEIU 1199 President Monica Russo. On one hand, the door hanger was laughable, while on the other, it spoke to the intentional decision of grassroots organizations and a union to work collectively as Statewide Alliance Group. SWAG specifically consists of: The New Florida Majority, Dream Defenders, Organize Florida, Florida Immigrant Coalition, SEIU, Faith in Florida, and Central Florida Jobs with Justice. Badili Jones is currently the Political and Alliance Officer at New Florida Majority. Southeast Regional Powershift: Youth Leader Training, Orlando Friday 19 February 2016, 2016, 22:00 Organized by : Ralph Benton Wilson Iv. Hosted by New Florida Majority, Florida Institute for Reform and Empowerment, and UnKoch My Campus. Poised to be one of the most transformational years ever, 2016 is already filled with seemingly unreal manifestations of injustice. With a growing income inequality gap, high corporate greed, increased influence by the Koch brothers, sea-level rise, police brutality, and continued environmental degradation we definitely have our work cut out for us. Bottom line, we need a shift in POWER. That is why on Feb 19-20, 2016 community leaders and organizers will be hosting a youth leadership training session for committed young people from around the region to assemble a team to mobilize for the Southeast Regional PowerShift conference this September. In this training we are looking for groups to explore connections between their goals and the power structures they are working against, the progressive framework that tie the work of activists and community leaders together, and develop a network of committed and passionate youth leaders who will lead us in the future. Those signalling intention to attend on Wherevent included Olivia Quinn, Rachel Stevens, Evan Weber, Fatima Ait Rami, Yulissa M. Arce, Ralph Benton Wilson Iv, Hannah Procell, Tim Heberlein, Talia Smith, Ava Howard, Gladys Nobriga, Indiga Flor, Lakey Love, Brittany Jacobs, Juddie Passion, Sam Michael Sickels, Erin Elizabeth Fagan, Everton St Patrick Foster, Sean Estelle, Kaila Rose Varano, Amanda Freeman, Steven Sloan, Nico Gumbs, Amy Ritter Valdivia, Haley Stickney, Amina Minka Spahic, Heiner Buchholz, Stephanie Porta. Former state Sen. Dwight Bullard said April 2017 he won't run for Sen. Frank Artiles' seat in Miami-Dade. "After much thought and personal reflection, I have decided at this time not to run for this office," said Bullard, a Democrat who said he will focus on his role as political director for the New Florida Majority. Gov. Rick Scott hasn't set a date for a special election yet and a spokeswoman didn't indicate his timeline Thursday. Artiles resigned earlier this month after using racist and sexist language toward African-American senators. Good conversation tonight with CAIR - Florida, The New Florida Majority and the ACLU of Florida on what advocacy means in these difficult times. — with Tomas Kennedy and Dwight Bullard at Islamic Center of Greater Miami-Masjid Miami Gardens. The New Florida Majority, April 27 2017. With Gihan Perera, Valencia Gunder, Andrew Gillum, Renee Mowatt and Dwight Bullard. June 12 2018– The New Florida Majority , enthusiastically announced Tuesday their endorsement of Tallahassee Mayor Andrew Gillum, who is running to become the Democratic nominee for Governor of Florida. The organization’s Ad Hoc Committee for Political Endorsements delivered its decision to the NewFM board just hours after Gillum and his fellow Democratic primary candidates participated in the Florida Freedom Forum Gubernatorial Debate in Miramar, in front of a packed audience of over 800 people. Tuesday morning, the board unanimously ratified the committee’s recommendation to endorse Mayor Gillum. Gillum was the clear favorite among the Spanish and English speaking The New Florida Majority endorsement committee who assembled Monday night. Candidates fielded questions on issues that reflected the concerns of the diverse audience that assembled at the Miramar Cultural Center. Those concerns included affordable housing, gun violence, criminal justice reform, education, immigration, climate change, and an economy that supports working class Floridians. “I think we all thought that Mayor Gillum responded the best and showed a deep understanding of politics and the problems of Florida,”said Claudia Toboada of Broward. Walking away from the debate, several members were already eager to hit the streets and mobilize community members to vote for Gillum in the August primary. Close to 13 million people are currently registered in Florida, including 4.8 million registered Democrats, 4.6 million Republicans and 3.5 million No Party Affiliation (NPA). While 75% of all registered voters came out for the 2016 elections, only 51% came out in the 2014 midterm elections that saw incumbent Gov. Rick Scott beat former Gov. Charlie Crist by one percent or 64,145 folks. "Beyond Resistance: Reclaiming our Progressive Future"
Climate change is not a problem for the future-it is here now. taking lives and devastating communities, as evidenced by this year's series of extreme weather disasters. Even with the facts of climate science on our side. the climate movement has struggled to break the vice grip of industry and entrenched interests blocking climate progress. but more frequent climate·driven disasters have raised the stakes and urgency of climate change to a broader public. With action on climate obstructed at the national level. building a powerful and diverse grassroots climate movement and bold political leadership at the state and local level are more important than ever, and there are clear signs of progress. Democracy Alliance Senior Strategy & Planning Officer and Climate and Clean Energy Equity Fund Director Roger Kim will lead a discussion with Florida State Senator Annette Taddeo (FL-5040), Washington State Labor Council President Jeff Johnson, New Florida Majority Executive Director Andrea Mercado, and University of California, Santa Barbara Professor Hahrle Han on groundbreaking strategies to strengthen the movement by addressing social and racial justice, new opportunities to build political power and leadership, and innovative climate and clean energy campaigns that improve people's everyday lives. The New Florida Majority & #TakeEmDownJax host an online discussion about the efforts to remove white supremist monuments from our public spaces ahead of Thursday's 40-mile, three day march from Jacksonville to St. Augustine as well as the connection to institutionalized racism and how Jacksonville’s organizers are fighting back! TONIGHT: Join us at 8 pm EST for a vital CTA vs Donald J. Trump's racist policies targeting Black immigrants. Color Of Change executive director #RashadRobinson and partners/panelists from the NAACP, Advancement Project (DC), Black Alliance for Just Immigration, UndocuBlack Network, Fanm Ayisyen Nan Miyami, The New Florida Majority, New Virginia Majority, along with actor Official Bambadjan Bamba will share what you can do in this vital forum. Call 866-757-0756 toll-free to dial in to connect to the town hall 1 hour before, or join via audio link 10 minutes before: http://fal.cn/ql_d — with Meena Jagannath, Kizzy Rock, Juno T. Starz, Denzel D. Burnside III, Valencia Gunder, Eel Kat, Jasmen M. Rogers-Shaw, Sarrah Fanny, Dwight Bullard, Emmanuel George, Asa R. Rogers-Shaw, Tifanny Burks and NAACP. NewFM staff spent the last two days in Jacksonville planning for an impactful 2018 and beyond. Thank you to Pastor Gundy of Mount Sinai Missionary Baptist Church for hosting us today and imparting us with your wisdom. We're inspired by the role that you, Mt. Sinai (and black churches throughout history) have played in the quest for black liberation, equality and justice for all. — feeling inspired with Yerba Mala Nunca-Muere, Mone Holder, Nancy Metayer, Dwight Bullard, Valencia Gunder and Asa R. Rogers-Shaw. Hurricane Irma proved that South Florida residents, government & physical infrastructure are not prepared for a severe natural disaster. Join your neighbors & community members in creating a disaster preparedness plan for your neighborhood! — with Maru Lanao, Wakumi Douglas, Francesca Menes, Dwight Bullard, Roderick C. Kemp, Isheka Harrison, Jen Janeway, Steven Moreno Jones, Tameka Bradley Hobbs, Nancy Metayer, Richard Way III, Trenise Bryant, Jasmen M. Rogers-Shaw, Tanisha Osorto, Debra J. Toomer, Tomas Kennedy, Kellie Tigertail, Mariama Gregory, Maria-Victoria Ramirez, Emmanuel George, Kizzy Rock, Meena Jagannath, Marcia Olivo, Asa R. Rogers-Shaw, Eel Kat and Erick On-Sang. 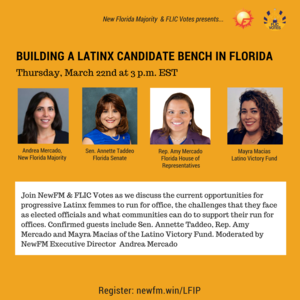 New Florida Majority executive director Andrea Mercado moderated a debate March 22, 2018 between Sen. Annette Taddeo, Rep. Amy Mercado to discuss Mayra Macias of the Latino Victory Fund, on "building a Latinx candidate bench in Florida". Moderator Cheryl Mizell, Frederick Ingram, Senators Chris Smith and Audrey Gibson, and Roxey Nelson. This page was last modified on 17 December 2018, at 22:44.